Khayangan Estate is breathtakingly beautiful and unimaginably magical. From the Sanskrit word for ‘Seventh Heaven’, Khayangan Estate is quite simply as its name suggests, a private villa estate that is stunning — heavenly — and the very best of the Bali luxury villas. Situated in Uluwatu on Bali’s Bukit peninsula adjacent to Bvlgari Bali Resort. Khayangan rests upon 1.5 hectares of magnificently landscaped gardens, clifftop, 170 metres above Selonding beach. The estate offers one of the best views in Bali with a 180-degree panoramic vista of the Indian Ocean. 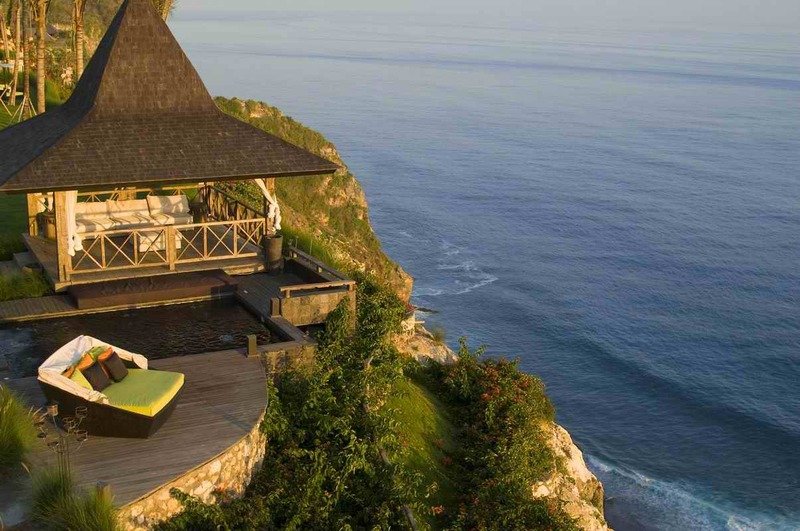 There are few other luxury Bali villas with a comparable view. The estate’s charm lies in its unique architecture, which features eleven antique joglos – once the traditional homes of Javanese aristocracy – now re-purposed as a private Bali villas and set amidst a sprawling garden with terraces of yellow irises, swaying palms and fragrant frangipani trees. Reminiscent of the traditional villages of ancient Java, Khayangan is totally unique when compared to any other luxury Bali villas or Bali resorts. The original features of these beautiful, century-old buildings have been preserved and complemented with fully reclaimed teakwood furniture, ultra luxurious contemporary furnishings and decoration, together with state-of-the-art entertainment and communication facilities, making this not only a wonderful holiday villa but also an excellent Bali wedding villa. spelling issues and I to find it very bothersome to inform the reality nevertheless I will surely come again again. Amazing issues here. I’m very satisfied to see your post. Thank you so much and I am looking ahead to touch you. Will you please drop me a mail? of the responses on Luxury Villas Khayangan Estate – Uluwatu, Bali � KARMATRENDZ. It ‘s the best place to have your vacation and bonding with your friends and relatives especially if you visit the place and feel the bali accommodation there. Best wishes from rentbalivillas, yours Rent House Bali rentapartment.